Nearest: Tube Station: Marble Arch 70 yards (64 metres), Railway Station: London Marylebone 0.6 miles (1 km), DLR Station: Tower Gateway 3.7 miles (6 km), Motorway: M1 Junction 1 5 miles (8 km). The Cumberland Hotel (A Guoman Hotel) is a landmark hotel, known across the world and located at the end of Oxford Street by the top of Park Lane on Marble Arch. Situated in the very heart of London, overlooking Hyde Park. On the edge of Mayfair, one of London most upmarket and exclusive areas with great shopping and amenities in the surrounding are at famous names such as Edgware Road, Oxford Street, Bond Street and Regent Street. This end of Edgware Road is very much geared towards the middle eastern visitor reflected in the flavour of the many shops, restaurants and bars on this road. All of London's attractions are easily accessible as is London's nightlife and theatreland. Transport links are excellent with the adjacent tube station, the large number of London taxis that are always passing through the major intersection of Marble Arch, the numerous bus stops in the surrounding area and the Tour buses that park up at the top of Park Lane by Hyde Park. A few of the nearby attractions include the Wallace Collection (0.3 miles), Madame Tussauds (0.7 miles), London Planetarium (0.7 miles), Green Park (0.8 miles), Serpentine gallery (0.9 miles), Buckingham Palace (1.1 miles), Houses of Parliament (1.6 miles) and the London Eye (1.8 miles) (Millennium Wheel). Synonymous with Marble Arch The Cumberland is a designer style hotel with the focus on style, design, comfort and personal service. The hotel lobby features a large open area and stunning modern works by the likes Sean Henry and Marijke de Goey among others. Bedrooms feature high tech amenities such as plasma screen or LCD television entertainment centres with pay channels, ironing facilities, safety deposit box, fridge, desk, hairdryer, tea/coffee facilities, direct dial telephone and WiFi internet access. Other extras include beds adorned with Egyptian cotton sheets high quality mattresses along with stylish en-suite bathrooms fitted with walk-in power showers and heated mirrors. Rooms are all air-conditioned. There are also extras such as stationary. The suites and apartments have larger bathrooms than the normal bedrooms with separate bath and shower along with top brand toiletries. They each have a 32" flat screen TV and extended check-in and check-out times of 10.00 and 16.00. You also get access to the executive lounge where business facilities such as free internet access and printing are available along with breakfast, drinks, tea and pastries throughout the day and canapé in the evening. Open 07.00 till 23.00. The Cumberland Hotel Marble Arch was the last known address for Jimi Hendrix and in his honour a specially themed and named suite has been created, the Jimi Hendrix suite. Sitting above the bed is a specially commissioned wild and exciting psychedelic mural design. A swirl of stripes racing up the wall and across the ceiling, stunning Vintage Fabrics, a 'Flying V' guitar and a limited edition white hand-stitched leather sofa are part of the furnishings and decoration. All floors have lift access. Room service is 24 hours. Dining: Carbon Bar: Located on the ground floor with 450 capacity. A fusion of bold architecture and 21st Century living, mixing industrial style with sultry, low-key glamour. Ideal for meeting for a quick drink and bite to eat. Serves a full range of drinks and features DJ music (Thursday thru' Saturday). The heavy industrial Chain Room and VIP Champagne Room on the mezzanine level can be hired for private venues. Open: 16.00 till late, (Thursday till Saturday noon till 03.00), (Sunday noon till 23.00). Rhodes Patrón Bar: This is the Cumberland's bar that is inspired by the worlds finest tequila brand. The atmosphere is laid-back and sultry, yet full of life and colour; the perfect setting for drinks after work, before dinner or late into the night. The Market restaurant: Spacious dining area where breakfast is cooked to order from one of the five separate open kitchens. Available for corporate entertainment or private events. Kua Bar and Lounge: Contemporary and relaxed style cocktail bar that is also available for private functions. Open all day for drinks, light meals and afternoon tea. Rhodes W1 Brasserie: Located on the ground floor with 150 seat capacity. Relaxed feel serving European classics with a distinctly British twist. Serves coffee all day. Roast on Sundays. Available for private or semi-private hire for up to 350 people. Open for meals: noon till 14.30, 18.00 till 22.00. Rhodes W1 Restaurant: Michelin star restaurant. The Cumberland Hotels flagship restaurant with an interior by British interior designer Kelly Hoppen. This 46 seat restaurant is owned by celebrity Chef Gary Rhodes where the menu has a French influence. Innovative yet accessible with a blend of style, service and good food and drink. Open: Lunch: Tuesday to Friday noon till 14.30, Dinner: Tuesday to Saturday 21.00 till 22.30. For the many business travellers frequent the hotel there are 26 meeting/function rooms available. They're completely self-contained and equipped with a host of business services and State-of-the-art equipment. For the energetic and health conscious there's the onsite Cumberland fitness centre. Here you will find the latest fitness equipment such as cardiovascular machines and weight machines as well free weights. The equipment have personal TV screens and headphones to keep you entertained during your workout. Open 06.30 till 23.00. As you would expect from a world renowned four star hotel services such as 24 hour reception, 24 hour concierge and 24 hour security are features of the hotel. Wireless internet access is available in all areas of the hotel. Amba Hotel Marble Hotel: is 174 yards (159 metres) away, has a guest satisfaction score of 86% and rates start from about £161. Grosvenor Hotel Victoria: is 1.4 miles (2.2 km) from here, earns a customer rating of 88% and base rates begin at about £145. Amba Charing Cross: 1.5 miles (2.5 km), rated at 98% and with rates from around £176. Royal Horseguards Hotel: 1.6 miles (2.6 km), rated at 89% and with rates from around £204. Compared to other London hotels: This hotel has been rated 71% by past guests. The London average is 80% and the average for 4 star hotels is 83%. Therefore this hotel is below average for its sector (star rating) . Guoman/ Amba Hotels across the chain average 85% so this hotel is below the average guest rating for Guoman/ Amba hotels. Milesfaster ranking: 701st from 866 London hotels, 6th of 6 Guoman/ Amba Hotels, and 305th of 328 four star rated hotels. Another to Consider: A similar type of hotel (size, rating) nearby (0.1 miles, 0.2 km) would be the 4 star Amba Hotel Marble Hotel, with rates that start from about £248 and which has an 85% guest satisfaction rating. The Amba Hotel Marble Hotel also offers: free WiFi. Looking for lower base rates? Then another option might be the Leonard Hotel And Residence. 0.1 miles from here (0.2 km), achieving a rating of 80% by its past clients where rates start from approximately £140. Something close by with a great client rating? We suggest the 5 Star Montcalm London Marble Arch may well be of interest to you. The Montcalm London Marble Arch is only 0.1 miles (0.2 km) away. The Montcalm London Marble Arch has an extremely high guest rating of 94%, one of the best rated London hotels. 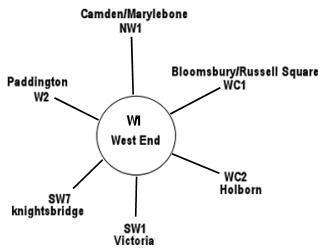 The fifty closest hotels from here (Great Cumberland Place, W1 postcode) that we have data for cover a 0.6 miles (1.0 km) radius. The 50 consist of 16 five star hotels (average rating 89%), 20 four star hotels (average rating 81%), 10 three star hotels (average rating 74%), 3 two star hotels (average rating 69%) and 1 one star hotel (rated 62%). Top 4 star hotels are Montagu Place Hotel and the Dorset Square Hotel (both 90%). Of these hotels the highest rated is The Beaumont London (5 star) at 99%. Of the nearest fifty hotels we have base rates for 49 of them. We have calculated the average base rate for all the 50 nearby hotels at £222 per night. The low end of the scale shows rates from £35 at Linden House Hotel (2 Star, 70%) to a high of £1000 at 45 Park Lane Hotel (5 Star, 98%). Rate averages for each star rating: Five Star average: £427, Four Star average: £154, Three Star average: £73, Two Star average: £57 and One Star average: £49. We rank hotels based on their guest rating but balanced for their influencing factors and we rank Cumberland Hotel (Gumoan) 40th (joint) of 50 nearby hotels and 18th (joint) for the 20 four star hotels in the area. Compared to the nearest alternative hotels this hotel is 19th of 49 (6th of 20 four star hotels.) for base rates. Balancing the hotels rates and user rating we rank the hotel 40th of 46 when judging the balance of price point to user rating (The Arch Hotel was top). Comment: To become the Hard Rock Hotel London in summer 2018, the first Hard Rock hotel in London. Formerly called the Le Meridien Marble Arch (till 2003). This is a Guoman hotel, the brand name given to the Thistle's range of upmarket hotels. Sometimes wrongly called the Guoman Marble Arch. Sold on 30th June 2010 by Royal Bank of Scotland (RBS) through CBRE Hotels for £215 million pounds to a joint venture of U.S. private equity firm Starwood Capital and property investor London & Regional Properties. During 2003/04 The Cumberland Hotel underwent an extensive £95 million refurbishment and modernisation program during which the time the hotel remained closed until reopening on October 1st 2004. Rhodes W1 Restaurant is 1 star Michelin rated restaurant. 2008 HRS Excellence Award for 'Excellence in Meetings'.